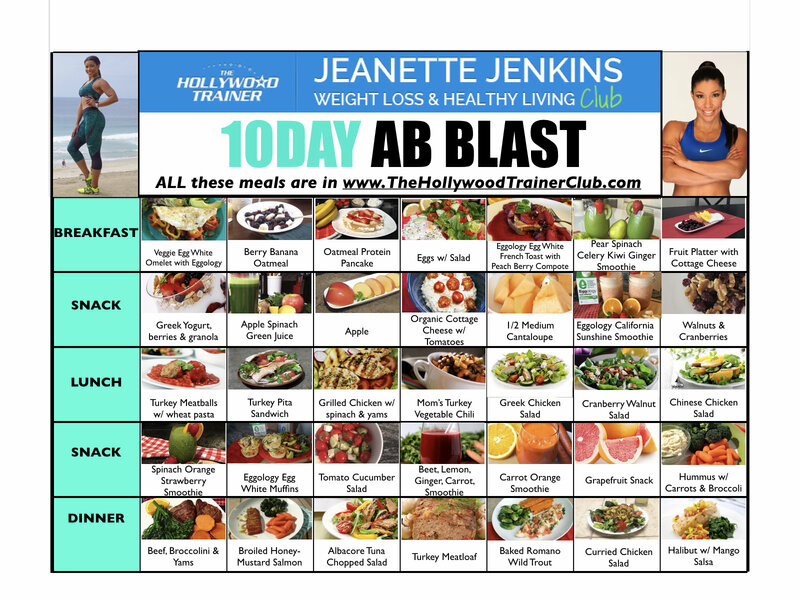 Our 10Day Ab Blast Challenge is in the “Virtual Gym” in The Hollywood Trainer Club and you can start TODAY! It’s not too late to join us, you can start TODAY! Our 30Day Summer Body Bootcamp starts Monday, May 21st! Join us! Every week there’s one Treadmill Workout (optional outdoor 3mile run/walk/jog), 3 Cross-Training Workouts that you can do at home (Cardio Kickboxing, Pilates, Bootcamp, Yoga, Sculpting) and one Gym Workout (optional at home sculpting workout). The variety & various methods of training will challenge your body to help you achieve incredible results. All levels are welcome, beginner to advanced. All you need to do is join The Hollywood Trainer Club and for $20/month you will have access to all of the Workouts and Challenges,Healthy Meal Plans, Recipes, Daily Motivation and Community Wall. Join us! All of the meals below in this handy meal calendar are in the “Meals” section of The Hollywood Trainer Club. Just login to www.TheHollywoodTrainerClub.com, click on “Meals” and the “Recipes A-Z” for access to all of our 150+ Healthy Recipes. The best way to achieve your goals is to make a plan and we’ve already done all the planning for you! Post a message on the Community Wall in The Hollywood Trainer Club and let us know that you’re joining us!